Kayong mga KMU, medyo pigilan muna ninyo ang labor union. Ako na ang nakikiusap sa inyo. Magkasama tayo sa ideolohiya. Huwag ninyong gawin iyan kasi sisirain mo ang administrasyon ko. Kapag ginawa ninyo iyan, patayin ko kayong lahat. Ang solusyon dito patayan na. This was all in Tondo: a place that has been unfairly portrayed as a hub of violence brought about by poverty and desperation, whether in action films or in drama. 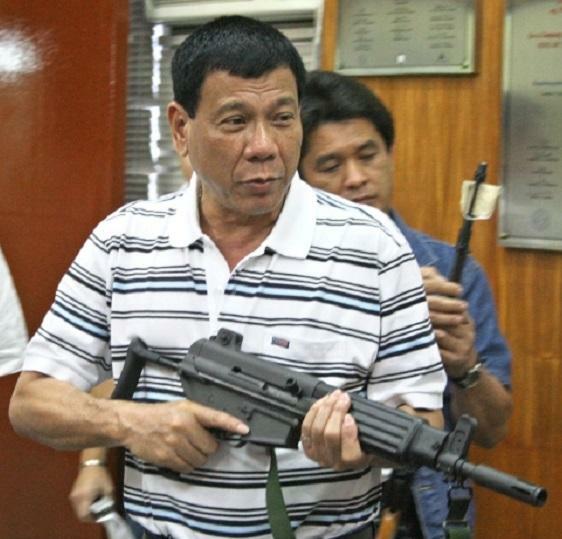 Rodrigo Duterte, for all intents and purposes, probably could have chosen a better place to rant about killing. But when your campaign thus far consists of the lock and stock that scrapes the bottom of the barrel, you really can’t expect much. Duterte probably won’t “kill” criminals: the “killing” may just be a metaphor for the tough stance his prospective administration will take against criminality. Duterte probably won’t “kill” union leaders: maybe this is just metaphor for his vision for the economy. He didn’t mean killing unions: he meant that unions shouldn’t kill businesses. His spokespeople and Alan Peter Cayetano are always there to lend context to whatever he’s saying. After all, if we really listen to what Duterte is saying, it may be a really agreeable point. Who wouldn’t want peace? Who wouldn’t want progress? As a Presidential candidate, Duterte should know that the Presidency relies more on clear communication than any other public office. For all the “Erap jokes” of his time, former president Joseph Estrada was able to somehow articulate issues clearly, no matter how disagreeable those positions were (be it the irony of a war on corruption, or a cringeworthy all-out war policy). Besides, theatrics and bravado like Erap’s were expected from someone who was an institution in Filipino action films before he entered politics. He understood that a great part of the Presidency was about communicating clearly. Or at the very least, project one’s self as Presidential. Not so Duterte: being a no-nonsense local government administrator is one thing, but in a political race with stakes as high as this one, perceptions must always be managed. Sure, the no-nonsense-bordering-on-thuggish approach on things should work for people who already know him and support him. He already speaks the language of a frustrated middle class who—rightly or wrongly—do not have to bear the consequences of a “if you’re not doing anything wrong, you have nothing to fear” mindset (more on that when I feel like it). But these are the major leagues; it’s not a local election where he can afford contempt, or be as bombastic as he wants without consequence. 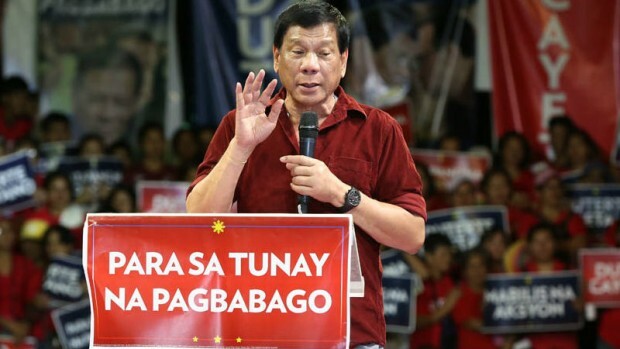 Especially when many voting Filipinos who don’t live in his bulwark know Duterte best as a guy synonymous with the “Davao Death Squad.” But that contempt and bombast is fairly easy to sustain in a campaign that won’t do away with old-school patronage: like freeing Gloria Arroyo when campaigning in Pampanga. Or a glimpse of policy: while Duterte won’t shy away from killing criminals himself (or so he wants us to believe), he’d have joint exploration talks with China. Or that as Duterte trumpets the triumphs of the “best President” Marcos, he kind of forgets how things like M99 only served to fulfill an edifice complex of sorts: the real costs of which are never really touted in histories that desire sound bites more than sound reasoning. What makes this even more problematic is how Duterte’s hyperboles—intended or unintended—dilute and even extinguish his message of change. The more metaphors and figures of speech come out of Duterte’s mouth (never mind the kisses that come along with it), the more it seems that not a lot of the agenda can be accomplished without resorting to some form of killing, figuratively or literally. For Duterte, it almost always has to be an extreme answer. It’s as if the context should adjust to him. Like we all should. As if we owe him… but that’s another story. Asked when he was willing to disclose his medical records following a migraine attack (or a mild stroke, whatever it is should be believed), Duterte responded to reporters with something you would expect from schoolyard bullies, and not from people running for the highest office in the land. But really, how many more “out of context” cards can you lend to someone who has argued at that level? How else can you argue what you really mean by circumcision? Among other things, this is probably the biggest problem of the Duterte campaign: not only is it running on the fumes of populist platitude, it doesn’t articulate itself well either. We still don’t know what “change” is. We still don’t know what stances there are, or what policy drivers and platforms can we expect from a Presidency that threatens to, well, shoot people. What Duterte and his campaign staff has to understand is that the game is different now: this is no longer just about a city, and no longer just about a regular term in office. This is a much, much bigger game. Instead, on an almost-daily basis, we’re treated to the petty insults and taunts of a man who, despite the populist rhetoric and messianic bromides of “change,” has to scrape the bottom of the barrel to make his point. And the more he toils at scraping that, the bottom may one day give way and take his Presidential ambitions down with it. Photos from the Philippine Daily Inquirer and GlobalBalita.com.